This work was part of a group show titled Nativity at The Market Studios, Dec 2009. I was curious about accounts of the Star of Bethlehem and found a number of popular culture and historic references to astrological phenomena that might explain the star as a real event that had both political and religious influence. The work developed from a prior interest in astrology as defunct science. I also liked the idea of playing with kitsch Christmas decorations to signify astrological phenomena, the array of lights and plasma ball attempting to mimic a Nova in Aquila, bringing home-science project and religious symbolism together. 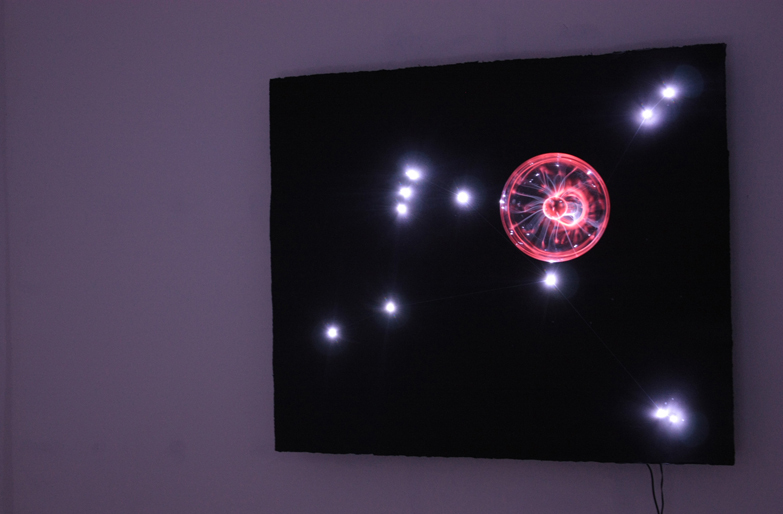 The work functioned as part of an installation that also included a video work titled Kepler’s Surmise a phone video piece showing a simulated conjunction of the Moon and Jupiter. These being just two of a series of astrological events now thought to have spurred the Magi’s visit to Bethlehem.